Please read here some reviews of Pyrgos House Walking Holidays’ participants (Kythira Walking Tour, Round North, Round South, Olive Picking Walking Weeks). How we experienced our 9-day Kythira walking tour with Pyrgos House? To summarize it in one word: fantastic! We did both the north and south walking tours as first visitors this year in March. Frank managed to get some lodging places and restaurants to open just for us. This proves to us he has excellent contacts, is very much liked by the locals and will not stop to provide his guests the best possible tour. Many positive things have been said on this site and we found they are realistic and true. In every aspect the program, routes, restaurants and places to stay were perfectly organized. Sometimes modest, which can be expected at a pristine island with a small population, but always with a warm welcome and endeavor to make your stay pleasant. The adventure and pleasure to us lies in the long walking tours themselves. Kythira has an abundance of different routes of different length and level. Frank has described them very clearly, with interesting historical information added. Let him design the tour that suits your length of stay and wishes. You will get a tailor made, perfectly organized walking tour on a very quiet and beautiful island, with hospitable Kythireans along the way. We hope to get back there in the coming years. In May 2017 we visited Kythira for the first time, doing the Round North Trekking. It was a great experience. This year we came back, in another season, for the Round South Trekking. Walking 8 days long, from Mylopotamos to Livadi, Chora and Kapsali. On September 24th we attended the yearly procession at the Panagia Myrtidiotissa Monastery. We were very impressed as well by the storm blowing through the island for two days. We totally agree with the other reviews: organisation, passion, flexibility, beautiful tracks and good accommodation… Frank, you are doing a great job. We would also like to thank Iota, Vangelis, Manolis, Frederik, Popi and Yannis for their hospitality and for making our holiday unforgettable, efcharisto! Ευχαριστώ! We are sure to come back to this special island of Kythira because there is still much more to discover. Today’s walk is full of nature. Spanning the old stone paths of central Kythera, you will experience intricate archaeological architecture, dating back to over 380 million years. With your back to the platia, turn left at the Y-junction. Cross a very old stone bridge, about 10m after the stream turn right onto the descending narrow stone path. From here, amidst the abandoned ruins, you will enter an unconquered aerial world. You will begin to crawl, on hands and knees, under the overhead foundation threads spanning the pathways. You will start to count, and after 229 habitations, you will turn right at the rusty spring. The path will start ascend gently. After 10 minutes you will reach the by now familiar shrine of Arachne – and if you listen carefully, you may hear Athena’s whispers, “if you want to spin, go ahead and spin”.. Here you can take a well deserved stretch, untangle yourself, and say blessings to any orb-weaver spider’s webs you may have inadvertently dislodged. Dear Frank, back home in the Netherlands, after our wonderful walking holiday on Kythira (9 – 18 May), we would like to thank you again for sharing ‘your beautiful island’ with us. From the start to the finish we experienced your care, organization and kindness. It was very enjoyable. Frank, your hospitality is great. You are a professional. We greatly appreciated your hand written notes upon our arrival and in every other accommodation, our accidentally meeting on Mylopotamos town square and that you came to say goodbye to us at the airport when we left. We decided to do some hiking in the Greek islands and was recommended Kythira because of it’s untouched beauty and varied terrain. Frank arranged an individual itinerary for us with self guided walks in the north and the south over three weeks. We love the beach so asked to stay a couple of extra nights in those locations. The walks were challenging but constantly rewarded us with simply amazing, breathtaking views from the changing landscape. We went in spring so the weather was comfortable but warm enough to swim. Everything was so well organised with the accommodation, breakfasts and luggage transfers. Frank’s travel guides provides details of places we could eat at, and if we needed to take extra food with us. The walks have many interesting stops that bring pleasure to reflect on the island’s history and give rise to some uplifting moments when viewing some of the small, sacred churches hidden along the trail. We always knew Frank was only a phone call away if we every needed anything. We have walked the Camino de Santiago across Spain and the Annapurna Circuit in Nepal. This was our third trek and we found it fabulous and the Kythirians warm and welcoming. It is simply one of nature’s best kept secret. We highly recommend trekking in Kythira with Frank’s wonderful little instruction booklets personalised for individuals with all his attention to detail of each location. The guided walk tour strikes a great balance between good solid walking, appreciating the sights and taking time to learn about and absorb island history and village culture. The excellent post walk lunches and evening dinners in local tavernas are another highlight. Our accommodation was also very good. I thoroughly recommend the guided tour. Great value. Before we arrived in April, we had a very pleasant email exchange with Frank in order to arrange everything. During our walking holiday we experienced all aspects that Kythira has to offer: peacefulness, flowers, herbs, flagrances, stunning views, crystal clear blue water, friendly people and of course all the wonderful walks! We really appreciated the walking books with descriptions and extra information. The walks were quite strenuous, probably also because of the temperature in late April, but we didn’t have any problems. There was plenty of time to have a rest and to enjoy the landscape. We loved talking with the islanders: they had time and attention for us. We heard wonderful stories. Although I prefer to discover and to walk in new areas anywhere in the world, Kythira is an island to come back to. Frank, many thanks again!! We loved it!! Starting the Kythira Walking Tour on April 2nd, we were Frank’s first trekking guests for 2017. Although it was still early in the season, the sun ensured temperatures of around 20 degrees and there was a huge variety of flowers and vegetation. For a week, we were discovering the beautiful, peaceful and impressive island. We walked along beautiful rocky paths to mystical ruins, monasteries, churches, castles, remains of old watermills and waterfalls. Frank is an ambassador for this island and is highly appreciated by everyone. And certainly by us. Nature, culture, adventure. Those who are looking for an exciting walking holiday should go to Kythira! We enjoyed walk 2 from Agia Pelagia to Platia Ammos and our stay in melancholic, desolate Platia Ammos. Another amazing walk: Potamos – Mitata. What a bizarre, dramatic and mysterious place is the island’s former capital of Paleochora. And the accommodation in Mitata is great!! Half way through our walking holiday, we’re now in Avlemonas: we are enjoying it a lot. And how beautiful are Avlemonas’ white painted houses scattered in that rugged landscape. During the walk from Mylopotamos to Livadi we enjoyed tsipouro at Nikos and fatourada and cookies at Maria’s. Livadi is a charming village. The people are warm-hearted. And we are convinced that there are more churches than people on the island. It was great that we have been able to see the interior of some of them. Chora, here we come! Frank, thank you very much for the Easter bread. The ‘English’ school buildings are beautiful with a fascinating history. The one in Livadi has 2 owls’ nests! The walk to South Cape Trachilas was spectacular. Last evening we joined the Good Friday Procession through Chora. It was lovely. In early May 2017 we had an unforgettable week on Kythira. The island is beautiful and not yet discovered by mass tourism. The people are very friendly and welcoming. You can eat delicious local food everywhere. What made the walking tour so very special for us is how Frank has organized everything. He has set out wonderful walking routes and his descriptions are very interesting and clear. He knows everything about the island. He welcomes you as a dear guest. Also, everyone on the island seems to know and love him. As a result, we, as guests of Frank, were received everywhere as friends. Kythira is a beautiful Greek island, but for us Kythira became much more than a beautiful place. We take Kythira with us in our heart. We had a wonderful time on Kythira, walking all over the island for three weeks! Frank suggested we should be here during Greek Easter Weekend. Arriving on Good Friday we got the opportunity to witness several Easter ceremonies and traditions. Before coming to Kythira, we loved reading Frank’s book “Kythira, just a special island”. Anyone who visits the island should read this book. It is so nice to meet several of the people Frank interviewed and to know their story. Furthermore, the information from Frank was great, the route descriptions were detailed and the care he took, such as the notes he left in each accommodation was exceptional. Very good!!!! Again, Frank, thanks for everything, we wish you a lot of success and enjoyment in your work and take good care of the island!! We are coming back. From 12th to 21st of May 2017, we did the trekking tour over the beautiful island of Kythira. Frank organised a tailor-made walking programme for us (about 150 km) with surprising and varied routes through the beautiful landscape. We enjoyed visiting caves, churches, monasteries, ruins. We still remember the amazing light at the Mylopotamos waterfalls, the stunning views everywhere and spending time in hidden bays where we loved to swim. Frank’s notes provided additional information about all the sights which was very interesting to read during the walks. Frank, as our attentive and cordial host, the friendly Greeks, the great accommodations, the delicious food, the weather, everything contributed to our wonderful holiday on Kythira. Highly recommended for those who are in good shape and who are up for an active and adventurous walking holiday. Frank, what a nice guy! You can clearly see that he loves the island and he has convincingly persuaded us to love it too. It seemed like we were his only guests. That is not the case, but Frank has a personal approach and does everything to make you feel comfortable. Kythira is a small island, but you can walk for a long time on numerous goat paths through the highly varied landscape without meeting anyone. The accommodations that Frank has selected are without exception fabulous. In many places you do not see the host / hostess but you feel very welcome and free. The key is in the door or is under a stone. Breakfast is prepared by an invisible hand at the arranged time. You can chill on your own terrace or in your own garden, or even your own hotel. Every day there was a nice surprise for us. The trekking is tough in places: we are used to walking, but at times this was harder that we liked. In the Netherlands we easily walk 20 kilometers, but some climbs and descents with loose stones were more strenuous than we had estimated. But we did it and it was great. Frank has set out beautiful walks. His descriptions are very clear, informative and up-to-date. We highly recommend Pyrgos House to everyone who loves walking in nature, enjoying peacefulness and genuine Greek hospitality. Just go to Kythira! We have just come back from the Round South hiking trip. We have enjoyed ourselves a lot. Upon our arrival the taxi driver brought us to Mylopotamos. Once there, our hiking adventure began. The first walk over by the beautiful watermills and the next day the trip to Livadi. Wherever you go the nature always seems to be different. After Livadi we went to Chora, the capital of the island. Chora is a beautiful town with its very own castle in the clouds. Our last hike took us to Kapsali where we had a couple of days to relax on the beach. Our hiking holiday on Kythira was fantastic and unforgettable. All because of the island and its locals and, above all, because of Frank’s very good organization. He could always be reached and even came to see us off at the airport. We recommend everyone to have a holiday like this. Especially when you can, just like us, take beautiful hikes and enjoy the beauty, the calm and the real Greece. Even though I became hooked on hiking in Turkey over the past years, I have, as I was hiking on Kythira in April and May, found a place in my heart for this island. The island is so quiet and peaceful with a pleasant variety of unending nature and small, vibrant villages with friendly locals. I felt welcomed everywhere I went. Although I always worry that I will be overcome by my fear of heights during the walks, this has not happened to me while doing the round hike in the north of the island. The hikes and walks are described perfectly and are on paths that are quite easy to walk on, not many paths are too steep to walk normally. Everything on our tour was arranged to perfection by Frank. The time we went on a guided walk with Frank in a little group was a very nice way to spend the day. It is truly amazing how Frank, with his love for the culture and the locals, organizes these walks and takes people with him through the landscapes of Kythira. Thank you Frank for your great care. For me, Kythira is an island to return to. After spending many years hiking in Turkey, my friend Els and I wanted to give Greece a try. We settled upon Kythira, and round north. This island was a surprise to me, even though I had been to Greece before. Beautiful mountains (but not too high) and again and again you saw the sea in the distance. Hiking wasn’t hard thanks to Frank’s clear descriptions of the routes. Walking for hours without meeting anybody has never made me feel unsafe. Because the island isn’t a tourist hotspot, it was possible to have conversations with other hikers, which was very nice. We always felt very welcome and well cared for by Frank. All of our expectations were exceeded by the grand landscapes, the nice locals, the hiking trails, and the accommodation. Grand! Kythira and the planned out hikes by Pyrgos House are truly worth repeating. If I could, I would return tomorrow …. At the start of May we did the hiking trip around Kythira. On our first day we met Frank and received the directions for the walks, along with information and tips for our hiking holiday. During the entire trip the beautiful nature and amazing views were a key point. The directions for our walks were detailed and clear. With them we could easily find our way and during the walks it was very interesting to read the added information about history, culture and daily life of the places we visited. At the end of our walks we were greeted by lovely hosts at our accommodations. The hiking holiday, of 150km, was composed with care and was very attractive for fit hikers. The walks (that vary from 23km to 28km) are no problem if you are in good condition. Those who seek peace and calm and those who love the outdoors will have a great time on the island as it is free from mass tourism. We look back at our great holiday with joy and we wish all the hosts of the accommodations and Frank the very best! An amazing and diverse hiking island with very peaceful and beautiful walks. Very well organised by Frank, who gave us his personal attention: always available and supportive and always able to give us great tips. The information for the walks was very well organised: a good map, daily directions for the walks, and a lot of background information. The accommodations were very diverse in character and luxury, but all our hosts were heart warmingly hospitable and kind. The fact that many of them spoke English made our contact with them easier. Good luck to Pyrgos House! And, who knows, see you all next time! After doing the round trip in the north of the island in 2014, Elly and I chose to do the round walk in the south this year. Once again, we enjoyed ourselves very much. Nice and quiet, beautiful walks, cozy accommodation, hospitable locals, beautiful landscapes and nature and a variety of short and long walks. Very well described hikes, Frank’s support and great organization; everything accounted for. Kaliopi’s cooking in Mylopotamos topped everything off; now we must try to lose the weight we gained! I want to thank you again for our amazing time on Kythira. The love you have for this island is passed on through the beautiful walks on the island. We enjoyed the silence, calm and simplicity, but above all the overwhelming landscapes and nature. Thank you so much for your care and hospitality. First of all: we’ve enjoyed our time, from the first moment we arrived on Kythira to the very last minute! And Frank, his care, sociability and enthusiasm are without limit! You also see that he is very much appreciated by the locals, everybody seems to know him and greet him. Telling people you came with Frank and Pyrgos House brings a smile to everybody’s face. All the accommodation was fine; a slight problem we had with a shower was very quickly solved by Frank. We had a nice stay everywhere and were received everywhere with a smile. If needed, Frank would text us with some information. The hikes were diverse and described very clearly! Our holiday was successful and worth repeating for sure. 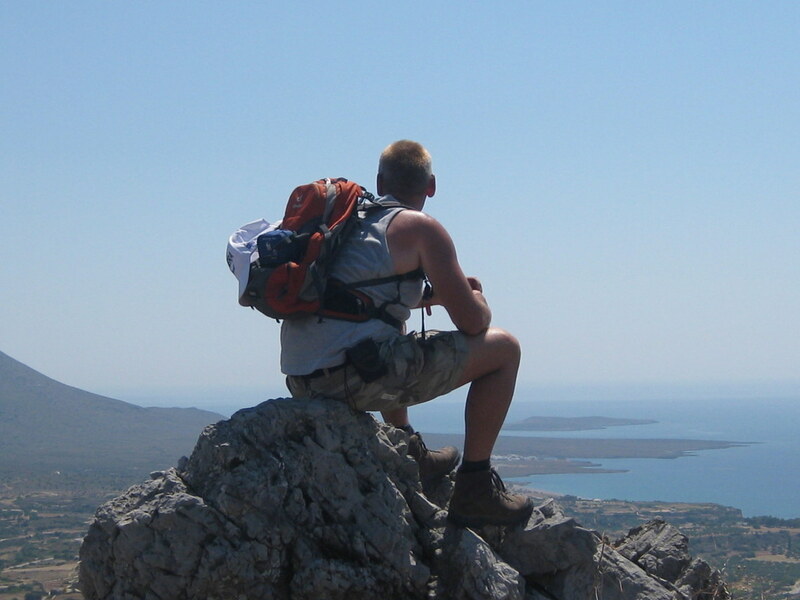 For anybody that loves hiking, peacefulness and nature, we recommend Kythira. After a chilly and stormy arrival on Kythira and a warm welcome by Frank, the Olive Picking Walking Week started. Picking location: Didimiotis family’s olive grove, beautifully located at the edge of Karavas. Father Nikos and friend Stamatis were continuously harvesting the olives from the trees with a handy machine while we and son George spread the nets and gathered and sorted the olives. Gradually the weather became brighter and warmer, the same for the relationship between the pickers and the family! Aunt Soula’s tiny olive grove needed to be taken care of as well and of course we were invited for a lovely lunch afterwards. On Thursday, we put the last olive in the bag and this had to be celebrated with a dinner at Didimiotis’ place. It was a very pleasant evening with dishes full of lovely food and with their own wine. As a desert: little pancakes cooked in the new fresh olive oil and served with Kythira’s famous thyme honey and pistachios. For a change, either with Frank or on our own, we went on a few beautiful walks. At the end of the week I left the island, very satisfied. In my suitcase, a bottle of ‘our own’ fresh olive oil which was produced during our excursion to Potamos’ Olive Oil Factory. I won’t forget this lovely week very easily! Picking olives on Kythira turned out to be great fun! After a royal breakfast on Potamos square we went, in pairs, alternately picking olives for one day or walking with Frank on the other day. On our picking days, our ‘boss’ was the Didimiotis family. Son Giorgos took us from Potamos to his olive grove where he instructed us, with a good sense of humour, how to use the nets, how to pick, gather and sort the olives. Then we had to work, because father Nikos and neighbour Stamatis had already set a good tempo. In the afternoon, mother Despina or friend Chloë with her son Nikos treated us to a tasty lunch. Apart from ‘just’ work, olive picking turned out to be a very social event, with beautiful stories, jokes and much family and neighbourly help. One day we helped aunt Soula and one evening we went with them to the factory to see how ‘our’ olives were pressed into oil. It was very special to participate in this way, in traditional Greek life. Working together, laughing together and being proud together of the green golden oil coming out of the presses. And most special was the dinner at Didimiotis’ place to which we were invited: the lovely food, their own delicious wine and lots of fun. ‘You will be back?’ Oh yes!, because along with the guided walks with Frank in between, picking olives never became too strenuous or boring. In fact, the walks were the best complement of another special Kythira experience. Therefore, I really can recommend the Olive Picking Walking Week! Over the years I have had several walking holidays on Greek islands. I usually arrange these by myself. In September 2015 I decided to use the services of Pyrgos House for my walking holiday on Kythira. It was my first visit to the island and I enjoyed it very much. I was interested in doing the 9 day Kythira Walking Tour but I wanted to stay longer. So Frank arranged a 14 day tailor made programme (in which he split the last route into two shorter ones, added a stay in Avlemonas and arranged some extra rest days). This tailor made programme was extremely enjoyable and the service was very professional. Since I was walking on my own, it was great that even though he provided perfect route descriptions, I could still call Frank for any possible assistance. In retrospect, I should have taken extra time and walked the tracks at a more relaxed pace in order to have more time to enjoy the landscape. Landscape wise, I have to admit that Kythira cannot compete with Southwest Crete, Tilos or Sifnos. However, when I consider all aspects (landscape, accommodation, quietness, hardly any tourism, organization of the tour), this Kythira Walking Tour scores so highly that I really would like to take another one of Pyrgos House Walking Tours. What a beautiful walking holiday we had on Kythira: an interesting island with very friendly and hospitable people. We met quite a few islanders with Australian and New Zealand connections, so it was nice talking with them in English. Much praise also for Frank: our return flight was cancelled and he arranged new tickets (ferry from Kythira to Piraeus, taxi to airport). Thanks a lot for this perfect holiday! We visited Kythira in the last week of September 2015 for ‘Round North’ walking tour. From Amsterdam, we first flew to Athens, and then we got on a propeller plane for our domestic flight to Kythira. Between our two flights we had a delicious lunch on the beach at the temple of Poseidon. This was a very good start to our holiday. Having arrived on Kythira, we had a taxi transfer to our first accommodation in Agia Pelagia. Here we stayed in a simple accommodation but on a beautiful spot along the sea front. Frank came to welcome us and gave us the necessary information – it all looked really good. During our walking holiday we stayed in Agia Pelagia, Platia Ammos, Potamos, Mitata and Avlemonas. Each village and each walking track has its own atmosphere which made our holiday very interesting. The accommodation varied from basic to very good, the locations were always special: everywhere we had a good bed and a very healthy breakfast. Kythira is an authentic island, there are many churches and ruins, its nature is diverse, the scenery is often breathtaking and the population is very welcoming. The temperature was high for the time of year – 25 to 30 degrees – which made the walks sometimes tough but doable, as long as you had enough water with you. One day, we had heavy rain in the morning, but Frank changed our program. This flexibility is great. We managed to find a small restaurant almost every day for lunch enjoying pure Greek meals. We had our dinner almost every night in the open air, most of the time with stunning sea views, good weather and enjoyable local wines. After a delightful week we said goodbye to Frank at the airport. We are very curious about Kythira in the springtime and certainly will come back to walk ‘Round South’. In May 2015, we walked for 14 days on Kythira and we can recommend it to anyone. In consultation with Frank we chose a combination of the walking tour ‘Round North’ and ‘Round South’. The tracks were really beautiful, nature all around, with a big variety in flowers and fragrances. – Round North’s most beautiful walk is the one from Potamos to Mitata: unspoilt deep gorges and the cursed town of Paleochora. – The most beautiful track in Round South is the walk around Mylopotamos with its waterfalls, old water mills and numerous stunning views. – Potamos’ town square, where everything seems to happen. Coincidentally, the day that we were there, the President of Greece visited the village. We felt like being part of one of Louis de Funès’ movies. – If you like to have a beach to yourself, then visit Agios Nikolaos Beach in the north. Here you can swim next to the church, protected by the gods… Don’t miss it. During the Kythira Walking Tour, we experienced an island which is still unknown: in one week, we met only 5 other walkers. It is unbelievable to think that this still exists in Europe. Every day we were excited about where the route would lead us. The variety is very large and the stunning views are a constant factor. The highlights for us were Paleochora and the final walking day: Livadi, Felotti Bay, Chora, Kapsali Bay, Agia Sophia Cave and the gorge. All accommodation was good. We experienced great hospitality, felt at home everywhere and had very good and tasty breakfasts. September is a good month for walking: often we swam in the warm sea and, every evening, we had dinner outside. But we have to admit that we are curious about spring on Kythira, with all the flowers. Hopefully, we will be back one time to see it. Frank, thank you so much for the splendid organisation. The only time that something went wrong, it was our own mistake. Now Kythira belongs to us too! Being experienced walkers, we dared to do the Kythira Walking Tour as well. We have to admit that the hills which we saw from the plane proved to be tough climbs. Frank gave us a very complete information map with daily route descriptions. We also enjoyed the detailed written information about churches, caves and mills on his beloved Kythira. If you are an energetic walker who loves to jump into the inviting sea, being invited by locals to pick fresh figs and nuts, to enjoy peaceful terraces, original guesthouses, a pleasant climate and a well organized but strenuous walking holiday, then you have to contact Frank! 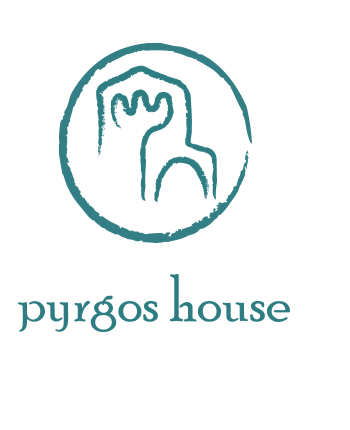 Pyrgos House, thanks a lot for this wonderful experience. Having walked the West Highland Way in 2013, we actually planned to do another walking tour in England. However, while searching on the internet, we found information about walking holidays on Kythira. Having read more about this island, we became more and more curious. So, we booked the Kythira Walking Tour with Pyrgos House. On Kythira, we met Frank who clearly informed us about the tour. He gave us the elaborate route descriptions with detailed information. A day later we started the tour through very diverse landscape. We enjoyed the views, the blossoms and aroma of thyme, broom and lavender. The routes led us past monasteries, old water mills, caves, springs and secluded beaches. We were overwhelmed by Kythira’s peacefulness. The accommodation was also very varied: from B&Bs to small hotels or comfortable apartments. Every morning we had a very good breakfast and enjoyed the villagers’ hospitality. I still remember sitting on one the village terraces, enjoying a cool Mythos beer, after a day walking. We will certainly go back to this beautiful, authentic island. It’s a topper! We enjoyed the Northern Route – with some extra days afterwards in Kapsali. Heavenly: the tour was beautiful and very well organized. We were completely relaxed. We liked everything, totally awesome. Frank provided us with written information about the island’s people, history and culture. This was very special. Frank’s walks and route descriptions were lovely and precise. Duration, difficulty and diversity were just fine. We started to love the island and its special history. Our conversations with young and older Kythirian Aussies contributed to this feeling. Potamos, Avlemonas, Agia Pelagia, Kapsali, Mitata’s caves, the many churches, the deserted villages and the beautiful Byzantine Museum were the daily highlights. Our visit to St John Cave, in the rocks above Kapsali, was an emotional experience. Again, it was a great tour!! This year, we did the Kythira Walking Tour for the second time and it was a beautiful experience again. Nothing seemed to remained the same, we were surprised continuously. Nature was in full bloom, bee-eaters were busy, stunning views and, of course, the very friendly islanders. We felt like coming home again and sometimes we even were recognized. The weather was ideal, not too hot and with some wind. Everything was perfectly arranged by Frank – we even could tell him our wishes for dinner: in Platia Ammos, the gigantes were specially cooked at our request. Kythira remains very special. We will certainly come back again. Kythira is a beautiful island. Frank gave us a warm welcome and informed us about the walking tour. The nature was so beautiful with all the flowers. We enjoyed the walks, which were sometimes quite strenuous, along the quiet villages, the diverse nature and culture. The route descriptions and information were very clear. The accommodation was good and the islanders are very friendly. We will certainly recommend Pyrgos House’ walking tours. At the beginning of April, we went walking on Kythira. It was our first holiday together and also our first walking tour. Our first impression of the island was not very overwhelming – we mainly saw the monotony in the landscape – but, during our first walk, we had to adjust our thoughts. And we kept on doing this. Kythira really is diverse with its stunning views, small paths and its interesting mix of nature and culture. Frank organised everything perfectly. He speaks with passion and pride about the island. His attention and care for the walker is great. The accommodation was carefully selected to the extent that we cannot choose our favourites. In one the view was splendid, in another the beds were extremely comfortable or breakfast was rich and extremely tasteful. We think that we have been spoilt… everything was just right: route descriptions, accommodation, restaurants and weather. As a small scale tour operator, Pyrgos House offers individual treatment for each guest. Heart warming! Kythira is a rising star. Only a few nature lovers know of this heart warming Greek island, but Pyrgos House owner Frank van Weerde will inspire many more walkers. During my second visit to Kythira, I was surprised by its variety and don’t think that, as an experienced walker, you will get easily bored. Frank’s perfectly described routes lead you through many different landscapes. Alternately, you can walk along woodlands and moorlands, along small vineyards and olive groves or through a peaceful valley with cypresses. On your way, you cross a gorge, take a break at one of the Byzantine churches or at an idyllically located well. Sometimes, a small isolated beach invites you for a refreshing swim. The peacefulness is overwhelming and the islanders are very friendly and hospitable. In addition to this, Frank is an outstanding organiser: rarely have I felt so carefree. They were 7 fantastic days… Our expectations were high and they were fulfilled. It was a great experience. We didn’t even get lost this time, which says a lot about us and how well Frank has organised and documented everything. We walked along spots that we would never have found by ourselves. The accommodations were excellent as well. Big compliments to Frank, who provided us with an unforgettable walking holiday. It was fantastic. First of all the welcome by Frank, the route descriptions and all the extra information. During the walks through the beautiful nature, we enjoyed reading about Kythira’s history. The accommodations were great as were the restaurants, some of which opened especially for us. Next year we will come back for the southern tour! We enjoyed our stay on Kythira enormously. We did a tailor-made walking program which was perfectly organised. We walked for two weeks and we enjoyed the peacefulness, the space and the beautiful nature. Every walk was a surprise because of the ever changing and fascinating nature. We cannot make a top three of the walks, because we wouldn’t do justice to the other walks. The accommodations were above expectation. We would like to thank Frank for this unforgettable holiday. Kythira: a beautiful start of our walking season! My wife and I are enthusiastic walkers and it was our second time in Greece. From 9 in the morning until 5 in the afternoon, we walked through virgin nature. As a son of a bulb-grower, I enjoyed discovering the flowering wild bulbous plants, the fragrance of the broom and the numerous orchids. The coast, the plateau, many (cave) churches and small villages alternate with olive groves and vineyards. We had the whole world for ourselves – only once did we meet another walker. Because the tourist season hadn’t yet started, Frank had to arrange the accommodations and the restaurants which opened especially for us. He managed to do all this very well – for which we congratulate him. We had a lovely holiday and all praise for Frank. Kythira is a beautiful island, not as touristy as other Greek islands we visited. We arrived on Kythira with the ferry from Crete to be welcomed by Frank who gave us the route descriptions, a detailed map and much more information about Kythira. Everything was very clear: nothing to complain about. We remember with pleasure our relaxing holiday on Kythira. Everything was very well organised. Frank’s walks are planned and described perfectly. Alternately you walk through nature, along villages, inland or along the coast. The walks are good to do, sometimes a bit strenuous, but never too tough. Because you walk every day for quite a few kilometres, you need to be in good physical condition. However, if you prefer to programme extra rest days in between, Frank will arrange this! The different accommodations are carefully selected and fit perfectly into the village where you stay. We only met friendly people who did their best to make you feel at home. It was a wonderful and relaxing holiday.